A blonde, a brunette and a redhead are all stuck on a deserted island together. The island is 20 miles from the nearest inhabited island so they all decide to try to swim there. The redhead makes it 10 miles, is exhausted, gives up, and drowns. The brunette makes it 15 miles before she's too tired to go any farther and drowns. 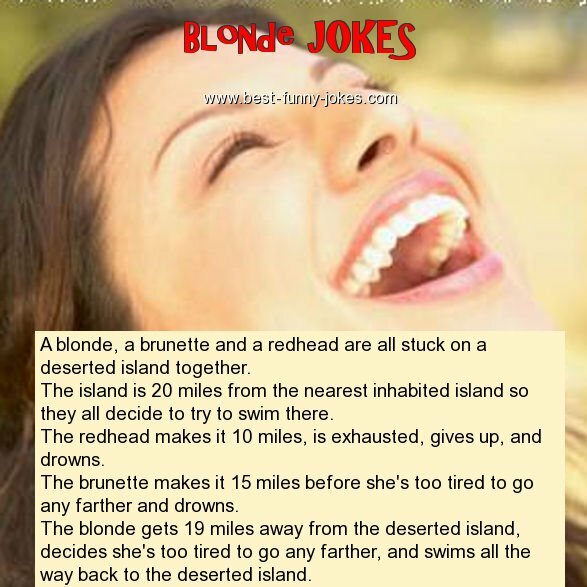 The blonde gets 19 miles away from the deserted island, decides she's too tired to go any farther, and swims all the way back to the deserted island.